Speaking of the popular Internet radios, we can’t help thinking of Pandora, a customer-oriented music radio station. Anyone familiar with Pandora knows that it lets listeners choose their favourite artist, genre or composer from its resourceful library. Supposed that you selected your desired artist, Pandora also recommends other similar artists to you. However, the cruel fact that Pandora doesn’t support direct music downloads is frustrating a lot users. So what if someone really wants to save songs from Pandora for a MP3 or car player? By now, there is no better way than recording from Pandora with some kind of software. Lucky of me, I just knew three nice ways to deal with this problem. The first tool I want to recommend is a professional audio recorder, which is called Streaming Audio Recorder. It’s capable of recording original-quality audio from sound card and microphone. Using it, you can record Pandora, Spotify, Jango and all similar Internet radios. In a word, any audio streams you need can be easily saved with this powerful audio recorder. Easy to use is only one of the reasons to introduce Streaming Audio Recorder. In fact, its extra functions are also useful in our daily life, such as audio converter, audio editor, CD burner and others like downloading video to mp3, searching free music and listening to Internet radios. From a long term, Streaming Audio Recorder is not a bad choice. In general, Streaming Video Recorder is applied for downloading videos from online websites like YouTube, Dailymotion, MySpace and many more. Actually, there is one point that often ignored by us, that is, this program is available for recording from Pandora. 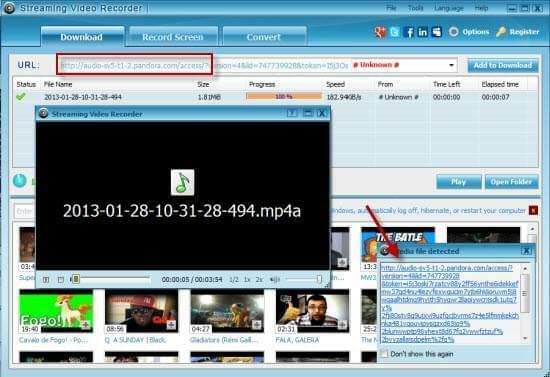 This is for the reason that Streaming Video Recorder supports grabbing audio in mp4a format, which is used on Pandora. See, simply play the radio you like, and the auto-record feature will save you all the troubles and record Pandora perfectly. What’s more, you may play the recorded audio with its embedded player, convert format, and even add to iTunes. Since mp4a format is rarely common, so if you convert mp4a to mp3 or other audio formats, the recorded Pandora files will be easier to transfer to other mobile devices. 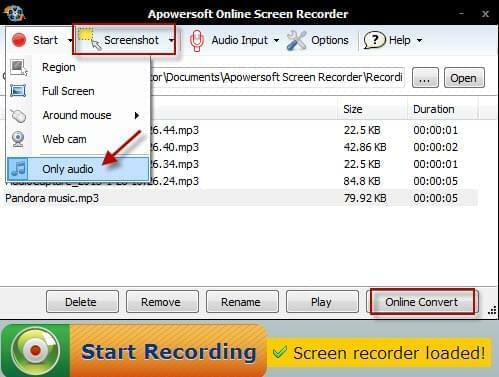 Although Apowersoft Online Screen Recorder is an online tool mainly for free recording screen, it supports recording only audio yet. Most of all, it’s FREE and online for you. Instead of downloading a desktop program, all you need to do is install a Java. No one will give up such a good chance to record Pandora radio, and I believe you’re the same. Apart from recording screen and audio, Apowersoft Free Online Screen Recorder can be used to make screenshot, convert recordings online and edit video while recording. It performs no worse than other professional programs; on the contrary, it’s more convenient for you. Rating: 4.3 / 5 (based on 30 ratings) Thanks for your rating!